Made with pure Epsom Salt and eucalyptus and peppermint essential oils, Muscle Soak Bath Salts will help to relieve even the most overworked muscles.This is the ideal bath salt for athletes, people with physical jobs, and anyone who needs to revive tired & aching muscles. Please feel free to visit our website http://www.sfbsc.com/ to learn more about the company. San Francisco Salt Company’s website: http://www.sfbsc.com/ (you can also sign up for our email newsletter on our home page). 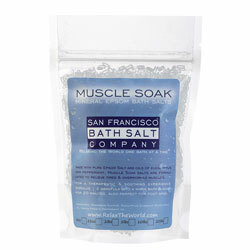 I received a Muscle Soak - Mineral Bath Salt - 5 oz package from Tomoson for review. You can purchase the same it i got here for only $4.99. It has a shelf life of 12 months if you keep it sealed. It is great to Soothe and revive tired, aching muscles and bring your stiff, overworked body back to life. For a relaxing & soothing bath soak simply dissolve a handful of salts under warm running water and then carefully and slowly step into the bath tub. For a more therapeutic experience use 2 handfuls and soak for a little longer. I filled my bath tub up with hot water and dropped 2 handfuls of muscle soak into the water. I relaxed for more than 30 minutes and I felt wonderful! Totino’s Fun Friday Night review and Giveaway!